grocery day... ewwww. luckily i only needed about half of what i usually buy so i got out of there in record time! such a beautiful day to spend inside a grocery store. 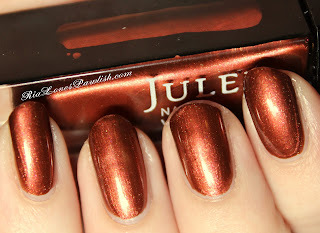 today we're checking out Julep Rachel, a gorgeous coppery frost. 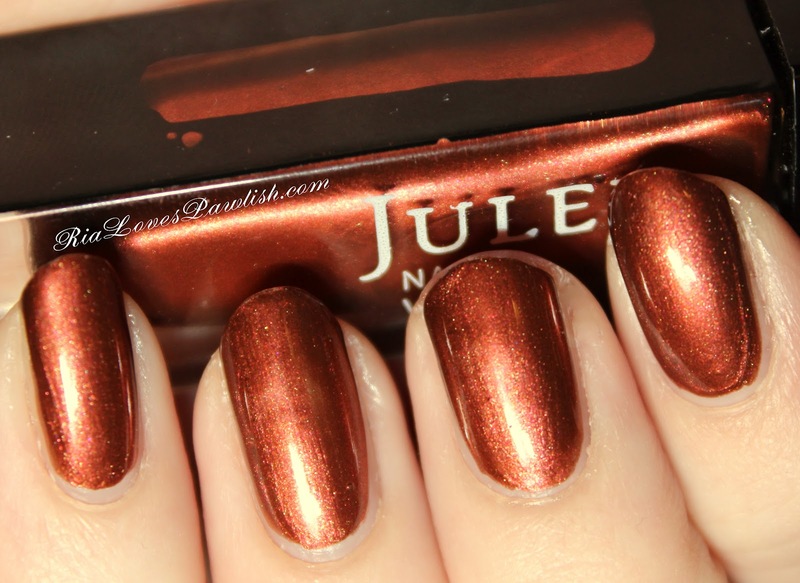 i think the best description of this polish is russet... it's copper with a huge amount of red undertones... reminiscent of a slightly dirty American penny. it is a true frost so some brushstrokes are visible... but not as bad as some. outside in the sun it's so sparkly and amazing! it only needed one coat of Seche Vite to bring out all the glimmer... and the best part... tuh tuh tuh tut tuh TAH... it's a one coater! even my OCD little mind knew that one coat brought out the best in this baby. one coat Seche Base, one coat Rachel, one coat Seche Vite.